Can I use Tamiyo's journal and Briarbrige patrol combo on opponents turn? At the beginning of each end step, if you sacrifice three or more Clues this turn, you may put a creature card from your hand onto the battlefield. 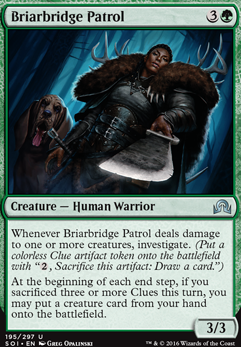 One suggestion I have is to add Briarbridge Patrol . The investigate on creature damage is not great, but the second ability coupled with Tamiyo's Journal makes up for it in my opinion. Sacking 3 clues to tutor, which 9/10 times will be a creature I imagine, and then getting to play it for free at the end step is stellar. 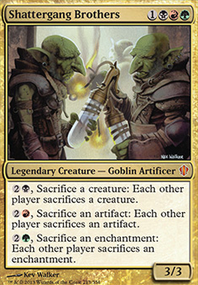 Yours is a very different Karador deck than my own, but it's the versatility that draws many people to him as a commander. I'd love some input, but beware that I've gone a bit over the top with my maybeboard. 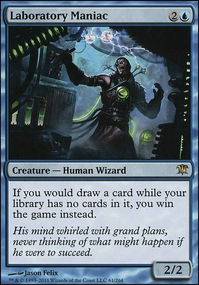 Spark: After the confrontation with the fused, corrupted Bruna and Gisela, after the 'victory' of the Gatewatch, Sigarda's heart longed for answers, for how to help heal her world. Her heart's cry pulled her out of her world to another, before pulling her back home, where she found Arlinn Kord waiting to speak with her. 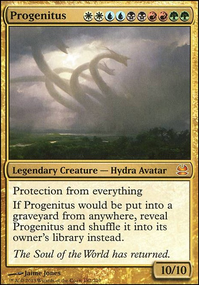 Realizing now the existence of other worlds, Sigarda has determined to find a way to keep the humans of her ravaged world safe from both internal threats and threats from other planes. Deck concept: Angels, Humans and Spirits working together to protect and support each other. I'm lacking a Tireless Tracker and Erdwal Illuminator but for investigate I have Tamiyo's Journal Weirding Wood Jace's Scrutiny Briarbridge Patrol Ongoing Investigation and Ulvenwald Mysteries the current deck build is very artifact focused and if possible I'd like to keep it that way. nice deck! I'd recommend adding a few more artifacts incase the combo doesn't happen with Briarbridge Patrol, Tamiyo's Journal, and Metalwork Colossus. That way if push comes to shove you can play metalwork colossus for super cheap.